Do you like the beach or the mountains? We know this is a hard question to answer if y ou've never been bitten by the mountain bug! But let’s say that once you do decide to visit the mountains rather than the ocean and all that stinky salt water and those screeching seagulls, do you know which mountains to visit? Just where is the best mountain experience for your family or group vacation? 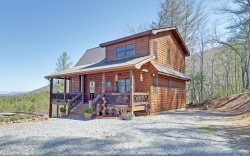 The simple answer is a vacation cabin in the Blue Ridge Mountains. And here’s why. Yes, Blue Ridge, GA is the gateway to the Blue Ridge Mountains as well as the Great Smoky Mountains. But did you know that Blue Ridge is also rich in traditional and cultural amenities? Ours is a quaint downtown Main Street USA experience, a “themed vacation experience” as good as they come. We offer residents and vacationers unique shopping experiences, fine eating establishments with renowned chefs from all over the world. The mountain culture in Blue Ridge is simple, but far from boring. We are a vacation destination of your dreams! Blue Ridge is also well known for our local community of artists. We are one of the top art communities in the USA, with art media from clay, wood, fabric, music, and writing. We may be slow and laid back, and talk a lot, but we do have culture, Blue Ridge culture. Many authors and writers come to Blue Ridge just to relax, recharge, breath in the freshen mountain air and become more creative. As residents and business owners in this Appalachian community, we love these mountains and have called them our home for generations. We also feel a deep desire to share this mountain community with others who wish to come to Blue Ridge. We want to share with others what we live and breathe all day, all year long. Our attitude is that we are hardworking people who have earned a good name for our family, we have earned our spot in civilization, and we have earned a friendly hello as we walk down a street in town. We have earned our place in the beautiful Blue Ridge Mountains. One of the things we hear people say about Blue Ridge is how nice the people are. “People I don’t even know said hello to me.” These are normal things to us here in Blue Ridge and surrounding areas. People say, “boy, everyone here moves so slow!” Well, they are right, we do move slow. That’s our attitude. We believe that quality is better than quantity and I would rather have 2 or 3 meaningful conversations in a day than a dozen that have no substance. You will find this attitude in many people in our area, and we are proud of it, and we hope you catch it! We are happy that we can go to the grocery store and talk with the local bank president, and the local plumber and include the local tourist. We all depend on one another and these conversations have real meaning to us because they are genuine. The Toccoa River is one of the most sought-after trout fishing rivers in the southeast US. 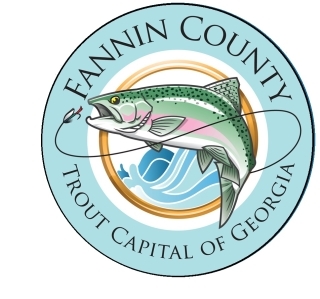 Fannin County, GA was named the Trout Capital of Georgia by the State House of Representatives. There are miles and miles of trout streams here and we recommend talking to any one of these fly fishing guides to get you started. We have a beautiful mountain lake, rich in minerals, yet cool and clear. Lake Blue Ridge is one of the most scenic lakes in the southeast. You can rent pontoon boats and cruise around and see the unique lakefront homes. And you can catch fish! Lake Blue Ridge is one of the northernmost lakes with crappie, yet one of the southernmost lakes with Pike and Walleye. The lake offers three species of bass; largemouth, smallmouth and spotted. The Toccoa River actually has a rare stream flow that is from south to north. In each one of our shops, galleries or eateries you will probably meet the owner or manager of the business. In most cases, these business people could have set up shop anywhere, and you can ask yourself, why Blue Ridge? Some may have lived here and moved away only to truly want to return. If they originally moved here from the outside world, they may have come for a visit or vacation, and fell in love with the community and culture of our town, and stayed. People love seeing all the beauty and listening to happy people talking. They love the smells of the mountains and the taste of the local food. And they love the Blue Ridge Mountain weather with all the variety of four seasons. People love what they feel in the comfortable weather, and their hearts enjoy being able to meditate and fall deep inside the mountain magic. It is like a special quality and reverence that makes a person love their surroundings. We call this the Blue Ridge mystique.